Assam finance minister Himanta Biswa Sarma. File image. 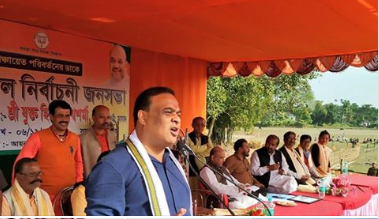 Assam Finance, Health & PWD Minister Himanta Biswa Sarma, who is in the Barak Valley to campaign for the second phase of Panchayat poll in Assam, on Thursday said after the loss in the last Lok Sabha and Assembly polls, the Congress would now lose the Panchyat polls too. Sarma, who is also the convenor of the BJP-led North East Democratic Alliance (NEDA), said this during election rally in Machghat under Hailakandi district of Assam. Stating that the BJP is going to win the panchayat elections, he said “being scared, he (Tarun Gogoi) is saying all these things”. Gogoi, while speaking to media persons during a press conference in Guwahati on Thursday slammed the BJP for using helicopters for campaign in panchayat elections. Gogoi termed the BJP the most corrupt party in the country given the way the saffron party spent so much money in panchayat election in the State including heavy expenditure for engaging helicopters in the electioneering. The election rally at Machghat also witnessed around 4000 people from seven villages in and around Tapang Block making a beeline to hear what he had to say, especially on the Citizens (Amendment) Bill, 2016. He said, his party’s stand is clear on this issue and “no one should play dirty politics over it”.